What red-blooded American wouldn't go for a dish whose lead ingredient is potato chips? Even better, this recipe is from the refined and very french inspired food writer, Dorie Greenspan (from her "around my french table" cookbook). It's basically a frittata you cut into wedges and serve as an appetizer, or with a salad for a light meal. 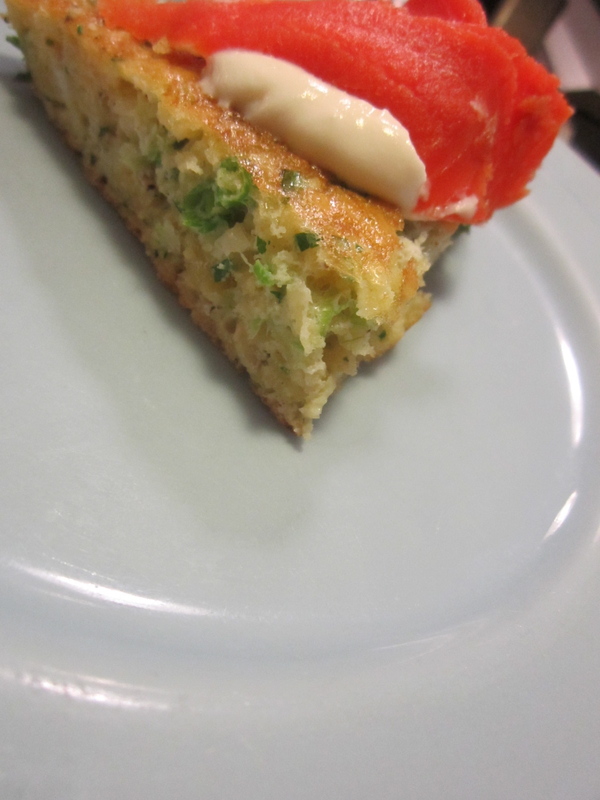 We had ours warm, with a bit of smoked salmon and a dash of sour cream on top. Preheat broiler and move rack to 8 inches below coils (this was the second from the top in my oven). Put the potato chips in a bowl and crush with your hands. Put the eggs, scallions, herbs, garlic and paprika or cayenne into another bowl. Whisk to combine and pour over potato chips. Heat a small oven-proof skillet on the stove over medium heat. Add olive oil. When the oil is hot add the egg/chip mixture and push to the edges of the pan, if necessary. Turn the heat down to low and cook for 2 to 3 minutes or until softly set in the middle and brown on the edges. Put under the broiler for 1-2 minutes or until golden brown on the top. Remove and slide onto a plate. Serve warm or room temperature.